Don Potter stands with the flag from the 18th green on Pinehurst No. 2 after making eagle. A vintage photograph showing Pinehurst owner Richard Tufts seated on a bench beside architect Donald Ross taken in the 1940s had long captured Tom Pashley’s fancy. Here was Tufts, third generation of the Pinehurst founding family and a giant in American golf administration circles in the mid-1900s, alongside Ross, the native Scotsman and architect of four golf courses at Pinehurst by 1919 and nearly 400 nationwide through his death in 1948. So when Bill Coore and Ben Crenshaw were headlong into restoring Ross’s work on No. 2 in 2011, Pashley, at the time the resort’s executive VP for sales and marketing, took the initiative to set up a similar photo of current owner Robert Dedman Jr. and Coore. Same bench setting, same hedgerow background, same black and white format, same positioning with the owner on the left (from the camera’s view) and the architect on the right. Richard Tufts (left) and Donald Ross. Pashley looks at the display with a sense of awe, respect and responsibility. Where Pinehurst has been and where it is going are front and center of Pashley’s mind every day. The excitement and attention that the resort and its famed No. 2 course garnered in the buildup and playing of the back-to-back U.S. Open and Women’s Open in 2014 have come and passed. But one important element of that special fortnight will remain and is a key initiative of Pashley’s in his first year succeeding Don Padgett II. Pashley was struck during the spring of 2014 by the energy and effort to burnish every nook and cranny of the 120-year-old resort and make it perfect for company—the competitors, USGA officials, worldwide media, sponsors and upwards of 40,000 spectators daily. His mandate to the resort’s employee partners now is to ensure they service members and guests and maintain the facility to levels worthy of a national championship. “This is the next stage after the Open,” Pashley says. “We’d spent seven years getting ready for this, looking forward to it. It was an ever-present topic in everything we did. It goes away, and now you’re looking for the next big thing. It’s a common question I’d get: ‘What’s the next big event at Pinehurst?’ At some point I got that question and got a little bit of a chip on my shoulder. Just a year removed from making golf history with back-to-back U.S. 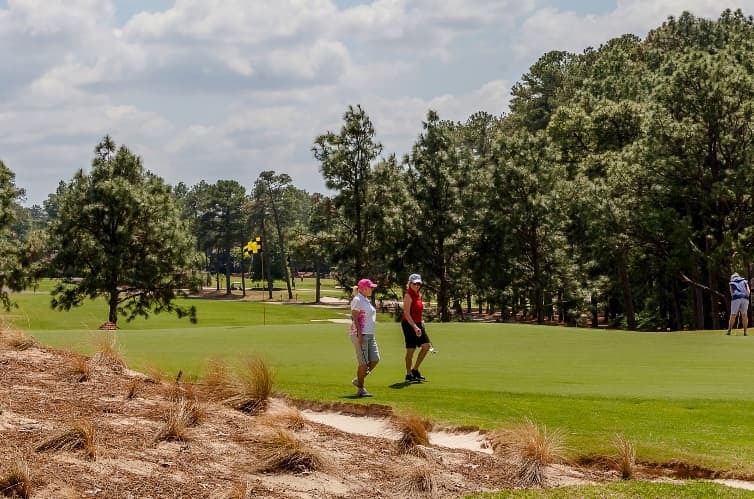 Opens, Pinehurst is committed to making every guest’s experience special. Pashley is committed to setting an example in that regard. One May morning, he was inquiring about finding a brand of Scotch preferred by a guest since the mini-bars in the Carolina Hotel stocked a different label. Another day he phoned Pinehurst resident Jim Dodson, author of the best-selling book Final Rounds, and asked Dodson to pay a personal visit to a guest who was himself playing his own version of the book through a terminal illness. If Pashley spots an aging sign, some paint that needs re-touching, a hedge that needs more precise trimming, he’ll snap a photo on his phone and send it to the respective department head. Pashley has worked at Pinehurst since 1996 after earning undergraduate and Masters degrees at Georgia and Duke, respectively, and spent one of his early years doing stints in every major department of the resort and club operation. He cracked a thousand eggs one more morning in the kitchen and swept dew off the front lawn of the Carolina Hotel with a bamboo pole. One of Pashley’s recent initiatives has been to redesign the name tags worn by employee-partners around the resort. Beneath the individual’s name is a word or two specifying his or her favorite element of their job or of the greater Pinehurst experience. It could be “Ross Architecture” or “The Caddies” or “Thistle Dhu” or “A Massage” or “The Cheesecake” or any of hundreds of snippets of life around the resort. “Our guests have wonderful interactions with our employee-partners and this is one more way to personalize that interaction, whether it’s Payne Stewart or golf history,” Pashley says. Pashley was heartened recently when he watched as one department head delivered a talk to a trade group and cited the “Open every day” dictum. That’s a sign that he’s being heard and that a standard of a bar set very high is resonating across the resort.